Crafting Play: Maracas ring in Cinco de Mayo! -Even make your own! Maracas ring in Cinco de Mayo! -Even make your own! 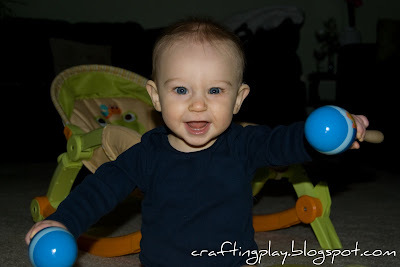 Maracas are practically big rattles, and great fun for babies. I got Ethan a "real" pair, but there are plenty of "baby safe" versions out there. I can't think of a way to celebrate Cinco de Mayo that Ethan would enjoy more! He LOVES his maracas--He totes them around everywhere with him! You can make some yourself!! In a previous post I covered how to make Discovery Bottles- for free!! These bottles, filled with popping corn (un-popped of course!) or some dried beans will do the trick as a great substitute! Of course, what Cinco de Mayo would be complete without some great Mexican music!?! Or maybe some Dance of the Cucumber thanks to Veggie Tales?! Remember, it's not a Cinco de Mayo party if you don't fall asleep with your Maraca!